Colors and patterns vary. Specify any preference in comments at check out. 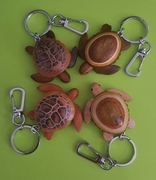 Turtle measures 2.25" Total length of key chain = 4.25"